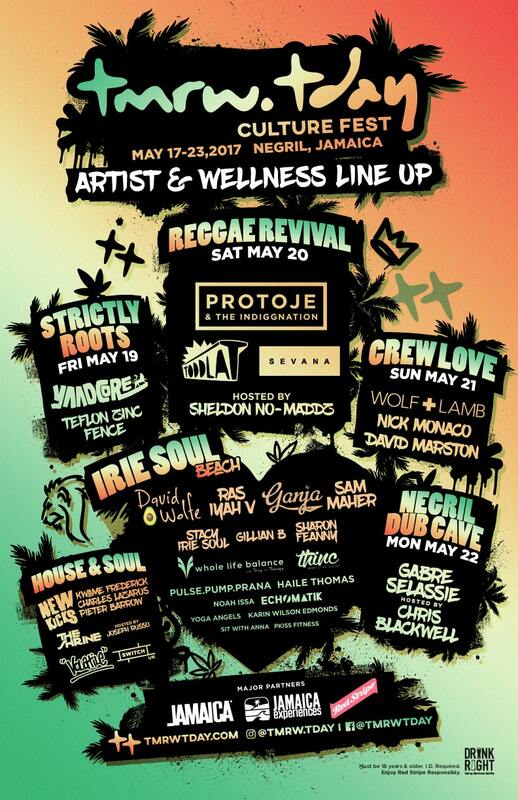 Designated environments at Irie Soul Beach, headquarters for Tmrw.Tday, will host an array of beachside entertainment, wellness activations and delectable culinary feasts, spearheaded by some of the most distinguished innovators in the world. Featuring headlining musical acts Protoje & The Indiggnation Live In Concert, Wolf + Lamb, Toddla T and the festival’s official Reggae Ambassador Chris Blackwell, Tmrw.Tday has mastered an eclectic fusion of local and international talent, celebrating Caribbean heritage and global sounds alike.The Reggae Revival Concert and Crew Love Beach Party Showcase are among top festivity highlights, in addition to nightly sunset Drum Circles at Irie Soul Beach featuring Sam Maher & Acro Buddhas plus intimate Dub & Reggae Lounges to showcase Jamaica’s most talented and respected artists. Among those artists joining the beachside party include: Gabre Selassie, Yaadcore, Nick Monaco, David Marston, Teflon Zinc Fence, and Echomatik. An island known for an explosion of flair and flavors, Tmrw.Tday will take foodies on a culinary quest through Jamaica’s famous food scene – a flavorful blend of influences from Spain, Britain, East India, West Africa, Portugal, China, France, and The Netherlands. Adventurous spirits can feast on tantalizing traditional fare while celebrating the importance of sustainable agriculture and organic eating. Led by cuisine curator Ras Iyah V Ital, the inaugural gastronomy program boasts the 7-Mile Organic Food Festival, Farm To Table & Experiential Dinner Series, Hot Sauce Competition, and will incorporate both vegetarian and vegan offerings prepared by internationally-acclaimed chefs such as 16-year old motivational speaker, youth health activist and vegan chef Haile Thomas. In recent years, our hearts have become heavy, so too has our planet. The earth continues to nourish us as best she can, but instead we abuse her through pollution, hate and entitlement. Now is the time to strip it all back and discover how you can help. The inaugural Tmrw.Tday Culture Fest aims to tackle some of the existential challenges humankind faces by stripping back materialism and focusing on core values such as mindfulness, through its unique wellness, gastronomy and music programming. A movement for change, attendees will embark on a weeklong personal journey of consciousness, conviction and growth. Free yourself from society’s intolerance through yoga practice, music, dance, mindful eating, sustainable cooking, art, nature and alternative therapies.